THERE are various web sites identifying Masha as an underage Jewish nurse (which is of course totally contradictory to the billboard content) See for instance  and . However, there are several hints that such an identification may be spurious and perhaps a later addition (not the hanging that took place, quite evidently). If the girl was Jewish, why wasn't she rounded up but allowed to work at a military hospital? If she was underage how could she have been a nurse working at a military hospital? If she committed sabotage in the hospital as the website claims, what did it entail exactly? It can hardly have been "auf deutsche Soldaten schiessen" inside the hospital. Sabotage in a military hospital would entail harming patients, but this would hardly evoke any sympathy at all. Malevolent nurses represent an archetypal scare. So the tale is bought up of "helping Russian officers escape." The choice of "nurse" and "underage" also appears selected to evoke sympathy. Finally it appears that the city of Minsk itself has labeled her as "unknown"? Perhaps the whole story requires more research into the identities, just to dispel another myth. This is admittedly one of the most forceful series of images available that have shaped the historical perspective of millions of people. THIS is becoming more interesting than I expected. Later today I will post a full gallery of 62 photos from this collection of original negatives, and ask for help. 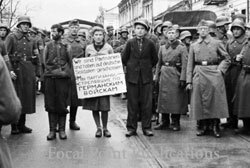 Interestingly, some low-quality wartime prints of these negatives are already circulating. I have no axe to grind, my interest is purely in establishing real history, the facts (others have other interests, mostly connected with what Norman Finkelstein identifies as The Holocaust Industry).